Welcome to the next instalment of Getting Better. For this article, I will be looking at a game that has been top of the charts for a long time: Puerto Rico. This game helped established the genre of "Eurogame" and was one of the first of its kind when it was published in 2002. Puerto Rico is an economy game based around the country that the game is derived from. Colonists arrive in Puerto Rico looking for jobs in San Juan or working the fields. As you develop your economy, you earn victory points for constructing buildings and shipping processed goods back to Europe. At the end of the game, the player with the most VPs wins. Each round, players select one of several roles available. Each player performs that role with the player that originally selected the role getting a small bonus. For example, Player A selects "Building" as a role. 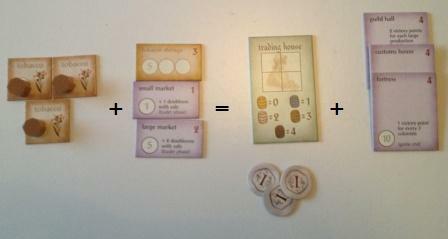 Each player then gets the option to construct a building. Player A gets one Doubloon discount off his building purchase. Playing this route requires you to obtain plenty of Corn and ship as much as possible, emptying the VP pool as quickly as possible. 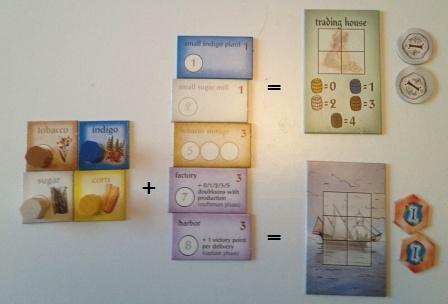 Being one of the last players for the first turn helps as you receive a Corn plantation instead of an Indigo plantation at the start of the game. You will want to pick up more Corn plantations during the plantation roles and this can often be dependent on other players' choices and/or how frequently Corn plantations appear during the early part of the game. Once you start producing Corn, start shipping them onto the largest ship available. You may be able to spend a bit of money early in the game on either a Small Market or Hospice, but ultimately you should be saving up for a Wharf so you can ship corn later in the game without being blocked. Be careful of making sure you ship Corn regularly, otherwise you risk short supplying future corn production if you hold onto your current wares for too long. This strategy concentrates on generating as much money via the more expensive goods (Tobacco and/or Coffee) and selling them for large amounts via the Trader's House. The first step is saving up for either the Tobacco Storage or Coffee Roaster and accumulating a couple of the appropriate plantations. Since available plantations are generated randomly throughout the game, this factor can often determine the choice between Coffee or Tobacco. In addition, you'll want the Small Market and/or Large Market to ensure you get the most out of selling at the Trader's House. To ensure the Trader's House is emptied frequently you will want either a secondary product (Corn, Indigo or Sugar) or an Office. Once the Doubloons start coming in, start saving up for one of the Large VP buildings and/or a Wharf (so you can ship your surplus goods for extra VPs). This is a relatively heavy build strategy so obtaining a Quarry or two will help alleviate the early construction costs. Here, you are aiming to diversify into as many produced goods as possible: as a result you should usually end up with viable options in both the Trader and Shipping roles (either maximizing your gains or blocking off opponents). For this you want to be able to produce at least one Corn, Indigo, Sugar, and then either Tobacco or Coffee. Your late game buildings should include Factory (which rewards you very well for producing multiple types of goods) and Harbor. Be very careful when you choose to take the Production role. Taking this role often turns on a lot of player options, especially if either the Trader and/or Captain role are still available to be taken during the round. Being able to execute your own strategy without facilitating your opponents' is key to winning the game. To score the bonus VPs for the Guild buildings at the end of the game, they must be populated. Watch out carefully for the end conditions (not enough Colonists, no more VP chips or one player fills his 12 building spaces). If the VP Chip or 12 Building spaces fulfils the end condition, then you risk missing out on the mayor role not being taken so you can rearrange your population for end game scoring. That's all this time around. Best of luck to you in your next game of Puerto Rico!